This evening’s UEFA Nations League encounter between England and Spain wasn’t without late drama as Danny Welbeck appeared to have scored a late equaliser for the Three Lions only for it to be overturned by the referee just moments later. The win tonight is massive for Spain with new manager Luis Enrique getting off to a victorious start in his reign in charge of the national team. Marcus Rashford opened the scoring for the Three Lions 11 minutes into the match only for Saul Niguez to respond almost immediately for Enrique’s men. 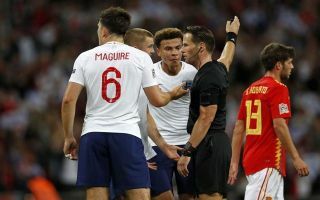 In the 32nd minute England fell victim to using zonal marking when defending a free kick, forward Rodrigo was able to lose track of Harry Kane and poke the ball into the net giving Spain a 2-1 lead going into halftime. A momentary lapse in concentration from the England team proved to be the deciding factor with neither side scoring in the second half. England continued to create chances and looked as though they could find a way back into the game – although England just weren’t clinical enough in taking their chances. There was a slight scare for Luke Shaw who was substituted off in the 53rd minute after a collision with Dani Carvajal. The Manchester United left-back – who had just returned to the national team setup was stretchered off. Fortunately Shaw’s head injury wasn’t serious and the left-back regained consciousness quickly after being stretchered off according to BBC Sport’s John Murray. Encouraging news regarding Luke Shaw. He is conscious and talking, following his nasty-looking collision with Carvajal. There was late controversy as substitute Danny Welbeck had his heroics in the 96th minute disallowed by the referee. Spanish goalkeeper David De Gea seemed to spill the ball after being contested by Welbeck before the Arsenal man hit the back of the net. The referee deemed that Welbeck has pushed De Gea – which led to Manchester United shot stopper spilling the ball. The decision seemed very soft on the referee’s behalf and England deserved to come out of the game with a draw. Pickford 6, Gomez 5 , Maguire 6, Stones 6, Trippier 7, Shaw – 7, Henderson 5, Alli 5, Lingard 6, Kane 5, Rashford 7. Subs: Rose 6, Dier 6, Welbeck 6. Subs: Asensio 6, Roberto 5, Martinez 5. England have the chance to right their wrongs from tonight’s match when the sides meet again during the next international break on Monday October 15th .